It has become increasingly evident that dietary Se plays a significant role in reducing the incidence of lung, colorectal and prostate cancer in humans. Different forms of Se vary in their chemopreventative efficacy, with Se-methylselenocysteine being one of the most potent. Interestingly, the Se accumulating plant Astragalus bisulcatus (Two-grooved poison vetch) contains up to 0.6% of its shoot dry weight as Se-methylselenocysteine. The ability of this Se accumulator to biosynthesize Se-methylselenocysteine provides a critical metabolic shunt that prevents selenocysteine and selenomethionine from entering the protein biosynthetic machinery. Such a metabolic shunt has been proposed to be vital for Se tolerance in A. bisulcatus. Utilization of this mechanism in other plants may provide a possible avenue for the genetic engineering of Se tolerance in plants ideally suited for the phytoremediation of Se contaminated land. 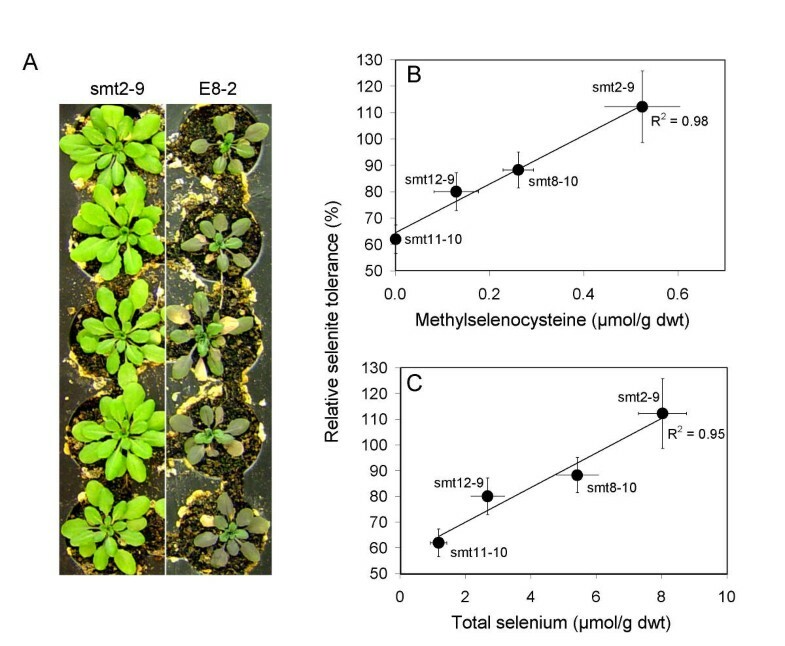 Here, we describe the overexpression of a selenocysteine methyltransferase from A. bisulcatus to engineer Se-methylselenocysteine metabolism in the Se non-accumulator Arabidopsis thaliana (Thale cress). By over producing the A. bisulcatus enzyme selenocysteine methyltransferase in A. thaliana, we have introduced a novel biosynthetic ability that allows the non-accumulator to accumulate Se-methylselenocysteine and γ-glutamylmethylselenocysteine in shoots. The biosynthesis of Se-methylselenocysteine in A. thaliana also confers significantly increased selenite tolerance and foliar Se accumulation. These results demonstrate the feasibility of developing transgenic plant-based production of Se-methylselenocysteine, as well as bioengineering selenite resistance in plants. Selenite resistance is the first step in engineering plants that are resistant to selenate, the predominant form of Se in the environment. Selenium is an essential nutrient for animals, microorganisms and some other eukaryotes . While Se deficiency is rare in the US, it does occur in several low Se parts of the world such as China, and can lead to heart disease, hypothyroidism and a weakened immune system [2, 3]. The toxic effects of excess Se have been known for some time. Short-term consumption of high levels of Se may cause nausea, vomiting, and diarrhea, whereas chronic consumption of high concentrations of Se compounds can result in a disease called selenosis . Only one form of Se, selenium sulfide, has been implicated as a carcinogen . The recognition of Se bioaccumulation and resulting wildlife toxicity at Kesterson reservoir in California and other sites has resulted in a surge of interest in phytoremediation of Se [5–8]. Selenium in the environment can be the result of either natural geological processes or human activities. The USGS has identified 160,000 miles2 of land in the western US enriched in Se from natural processes that is susceptible to irrigation-induced Se contamination, including 4,100 miles2 of land currently irrigated for agriculture . Selenium pollution can also arise from various industrial and manufacturing processes including procurement, processing, and combustion of fossil fuels , and mining . Interestingly, in the last decade it has become increasingly evident that Se also has potential health benefits. Anticarcinogenic activities of specific organic forms of Se against certain types of cancer have been demonstrated [3, 12–14]. In a long term, double-blind study, supplemental dietary Se was associated with significant reductions in lung, colorectal and prostate cancer in humans . Other studies have also demonstrated the chemoprotective effects of Se against breast, liver, prostate, and colorectal cancers in model systems [15–17]. Importantly, there is a great deal of variation in the efficacy of different Se compounds against cancer [13, 18]. Numerous studies have demonstrated the efficacy of Se-methylselenocysteine (MeSeCys) in preventing mammary cancer in rat model systems [16, 19–23], and importantly, MeSeCys has been shown to be twice as active as Se-methionine (the primary component of Se-yeast supplements) in preventing the development of mammary tumors in rats . Furthermore, MeSeCys in both garlic and broccoli has also been shown to be more effective than either Se-methionine (SeMet) in yeast, or broccoli supplemented with selenite, at reducing both the incidence of mammary and colon cancer in rats [19, 21]. This nonprotein seleno amino acid is produced in certain plants including members of the Brassica and Allium genera [3, 24], and in Se accumulating plants such as Astragalus bisulcatus [25, 26]. While the specific mechanism for the anticancer activity of Se has not been fully elucidated, multiple studies have demonstrated the ability of Se to affect the cell cycle and induce apoptosis in cancer cell lines [14, 24, 27–35]. There is also evidence that Se may inhibit tumor angiogenesis [36, 37]. Both of these activities would inhibit progression of early cancerous lesions. Plants primarily take up Se as selenate or selenite , which is then metabolized, via the sulfur assimilation pathway, resulting in the production of selenocysteine, SeMet and other Se analogues of various S metabolites, as reviewed by Ellis and Salt (2003) . The nonspecific incorporation of seleno amino acids into proteins is thought to contribute to Se toxicity . One proposed mechanism of Se tolerance in plants is the specific conversion of potentially toxic seleno amino acids into nonprotein derivatives such as MeSeCys [41, 42]. Some Brassica and Allium species, when grown in Se enriched medium, can accumulate 0.1–2.8 μmol g-1 dry weight MeSeCys or its functional equivalent γ-glutamylmethylselenocysteine (γGluMeSeCys) [13, 15, 16, 21, 24, 43]. However, certain specialized Se accumulating plants, such as A. bisulcatus, accumulate up to 68 μmol g-1 dry weight Se (6000 μg g-1 dry weight), of which 90–95% is MeSeCys in young leaves [44–46]. Selenocysteine methyltransferase (SMT), the enzyme responsible for the methylation of selenocysteine to MeSeCys in A. bisulcatus, has recently been cloned and characterized . The availability of such genetic material opens a practical avenue for the development of plants with an enhanced ability to biosynthesize MeSeCys. Such plants would be expected to not only be more resistant to Se, a valuable trait for phytoremediation of Se contaminated land, but also provide a plant based source of the anticarcongenic compound MeSeCys . Here, we describe the successful use of A. bisulcatus genetic material to engineer MeSeCys metabolism in the Se non-accumulator A. thaliana. By over-producing the A. bisulcatus enzyme SMT in A. thaliana, we have introduced a novel biosynthetic ability that has increased the concentration of MeSeCys and its functional derivative γGluMeSeCys, from essentially non-detectable levels in the leaves of wild-type A. thaliana up to 3.9 μmol g-1 dry weight in shoots. Over-production of SMT in A. thaliana (Fig 1A) increased the accumulation of MeSeCys from essentially zero in control plants (Fig 1B) to an average of 0.5 μmol g-1 dry weight in the highest SMT accumulating line (Fig 1B), with MeSeCys concentrations ranging from 0.09 – 1.3 μmol g-1 dry weight in individual plants from this line. MeSeCys accumulation was strongly correlated with the level of SMT protein in transgenic plants (Fig 1A and Fig 1B), confirming a causal link between SMT accumulation and the biosynthesis and accumulation of MeSeCys. Impact of SMT protein levels on accumulation of MeSeCys and total Se. (A) Relative SMT protein accumulation. Relative SMT protein levels were determined from digitized immunoblots, and represent the average band intensity (± SE) from 12 – 18 individual plants for each line. (B) Concentration of MeSeCys in transgenic plants. MeSeCys was quantified using HPLC (AccQ Tag amino acid analysis system) and its identify confirmed using MALDI-MS. Data represents the average (± SE) MeSeCys concentrations in 11 – 18 individual plants for each line. (C) Concentration of total Se in transgenic plants. Total Se was quantified by ICP-MS, and data represents the average (± SE) of 7 – 13 individual plants for each line. To further characterize the effect of SMT over-production, Se was extracted from shoot tissue and speciated using HPLC/ICP-MS and HPLC-ESI-MS. Of the total shoot Se in smt2-9, 27% was unextractable in the aqueous phase of a methanol/chloroform/water extraction, and assumed to represent mainly Se assimilated into proteins. Of the extractable Se, HPLC-ESI-MS and quantitative HPLC/ICP-MS revealed that 26%, or 1.16 μmol g-1 shoot dry weight, to be γGluMeSeCys, a derivative of MeSeCys (Table 1A, Figure 2). The identity of this compound was confirmed by coelution of Se in peak 4 with an ion of m/z = 313 [M+H]+ [80Se] (Figure 2A,2C) showing the predicted Se isotopic ratio [76Se(9%), 77Se(8%), 78Se(24%), 80Se(50%), 82Se(9%)]  and a consistent empirical formula derived from accurate mass measurement. γGluMeSeCys, is known to accumulate to high concentrations in both Se exposed garlic  and A. bisulcatus seeds . γGluMeSeCys is comparable to MeSeCys with regard to its anticarcinogenic capacity , with γGluMeSeCys being rapidly converted to MeSeCys by a transpeptidase in the body. Identity and percent composition of Se species in shoot tissue of SMT over-producing A. thaliana line smt2-9. 1Calculated using XAS data. 2Mobile phase water-methanol (99:1, v/v) 0.1% HFBA. 3Mobile phase water-methanol (99:1, v/v) 0.1% TFA. HPLC fractions (0.5 – 1.0 ml) were collected and analyzed for total Se by ICP-MS. Replicate chromatography was also performed using HPLC-ESI-MS to confirm the identity of the compounds in the Se containing peaks. The various Se compounds were quantified based on their Se content. Chromatography and mass spectroscopy data shown in Figure 2. Speciation of Se in shoots of A. thaliana over-producing SMT. (A) Arabidopsis thaliana smt2-9 HCl extract injected onto a reverse phase C8 column, eluted with water:methanol (99:1 v/v) containing 0.1% TFA, and fractions analyzed for Se using ICP-MS with 83% recovery of injected Se. (B) Mass spectrum collected in the region of peak 1–3 from the chromatogram shown in Figure 2A, revealing the expected [M+H]+ m/z = 184 and [M+H-NH3]+ m/z = 167 for MeSeCys, as well as the expected Se isotopic signature. (C) Mass spectrum collected in the region of peak 4 from chromatogram shown in Figure 2A, revealing the expected ion m/z = 313 for γGluMeSeCys, as well as the expected Se isotopic signature. (D) Arabidopsis thaliana smt2-9 HCl extract injected onto a reverse phase C8 column, eluted with water:methanol (99:1 v/v) containing 0.1% HFBA, and fractions analyzed for Se using ICP-MS with 55% recovery of injected Se. The majority of the remaining extractable Se eluted in an early running Se peak that contains MeSeCys, as identified by coelution of Se in this peak with an ion of m/z = 167 [M+H-NH3]+ [80Se] (Figure 2A,2B) showing the predicted Se isotopic ratio [76Se(9%), 77Se(8%), 78Se(24%), 80Se(50%), 82Se(9%)], and a consistent empirical formula derived from accurate mass measurement. Authentic MeSeCys standard also showed a major ion with m/z = 167, representing the loss of 17 as ammonia from m/z = 184 (data not shown). This early running Se-containing peak likely represents a mixture of Se-containing compounds , and was further resolved using the strong ion-pairing reagent HFBA to reveal the presence of three Se-containing compounds (Figure 2C, peak 1, 2 and 3). Peaks 1 and 2 were identified as MeSeCys by the presence of an ion of m/z = 184 [M+H]+ [80Se] and fragmentation of this ion, by the loss of ammonia, to m/z = 167 [M+H-NH3]+ [80Se]. Elution of MeSeCys as a double peak has been previously observed, and is though to be due to its partial protonation . Quantification of the total Se in these two peaks revealed that MeSeCys represents 43% of the total extractable Se (Table 1), or 2.4 μmol g-1 shoot dry weight. For this analysis, smt2-9 shoot samples containing the highest concentration of MeSeCys, determined using the AccQ Tag amino acid analysis system, were used. MeSeCys concentrations of 1.3 and 2.4 μmol g-1 dry weight, quantified using these two independent methods differ significantly, and we suspect that AccQ Tag may underestimate the concentration of MeSeCys due to the reduced derivatization efficiencies observed with standard MeSeCys. Of the Se injected onto the column, only 17% was found to be unaccounted for by peaks 1–5 when eluted with mobile phase containing 0.1% TFA (Figure 2A, Table 1). When using HFBA as the ion pairing reagent (Figure 2D), γGluMeSeCys was not expected to be eluted under the conditions used, leading to 28% reduction (83% – 55%) in recovery of injected Se. The minor Se peak (Figure 2, peak 5) representing 6 % of total extractable Se (Table 1), most likely represent a doublet peak of γGluMeSeCys produced by partial protonation . MeSeCys and its derivative γGluMeSeCys comprise 75% of the total extractable Se, or 3.9 μmol g-1 shoot dry weight, in SMT over-producing A. thaliana line smt2-9 (Table 1). X-ray absorption spectroscopy (XAS) can be used to obtain direct information on the in vivo speciation of Se in plants, avoiding the possibility of extraction artifacts [41, 42]. XAS of shoot tissue from SMT over-producing A. thaliana indicates that the majority of shoot Se is associated with two C atoms (R-Se-R) (Fig 3), and the concentration of Se in this chemical form increases in direct proportion to the level of SMT over-production (Fig 1A, Fig 3). XAS results are consistent with MeSeCys and its derivative γGluMeSeCys accounting for the majority of Se in planta in the SMT over producing plants. The XAS also revealed the presence of a minor selenonium species (Fig 3), which may represent Se-adenosylselenohomocysteine as observed in yeast . This compound would be expected to be strongly retained during HPLC , and may represent a portion of the 17% of Se in the smt2-9 extracts that was not recovered from the column during HPLC/ICP-MS (Figure 2A, Table 1). Se K X-ray absorption near-edge spectra of shoots of A. thaliana over-producing SMT and control plants. (A) Normalized spectra of different plant lines (filled circles), overlaid with the results of fitting each spectrum to a linear combination of spectra of standards (solid line). (B) Fit deconvolutions for two examples of the samples shown in A. Each panel shows the data and fit (as in A), the residual (dotted line beneath) and the spectra of standards scaled according to their contributions to the fit. The best fits were obtained using selenomethionine (RSeR), aliphatic selenonium (R3Se+), selenite (SeO32-) (all in aqueous solution) and elemental selenium (Se0). Other standards (not shown) were tested: aqueous selenate did not contribute to the fits, and dimethyl selenoxide gave poorer fits (as judged by the residuals) than the selenonium species. Note that selenomethioninine is chosen to be representative of RSeR species, and its spectrum is not reliably distinguishable from that of MeSeCys. (C) Chemical speciation of Se in planta in shoots of A. thaliana over-producing SMT and control plants. Se K X-ray absorption near-edge spectra were fit, as described in Figure 2, to produce quantitative data on the speciation of Se in shoots of A. thaliana. Total Se accumulation (Fig 1C) and percent speciation are combined to produce absolute concentrations of the various Se species. Exposure of plants to selenate produced no detectable MeSeCys in either SMT over-producing plants or controls (data not shown). Measurement of Se speciation by XAS in selenate treated plants revealed that approximately 70% of total Se remained as selenate in both SMT over-producing and control plants. 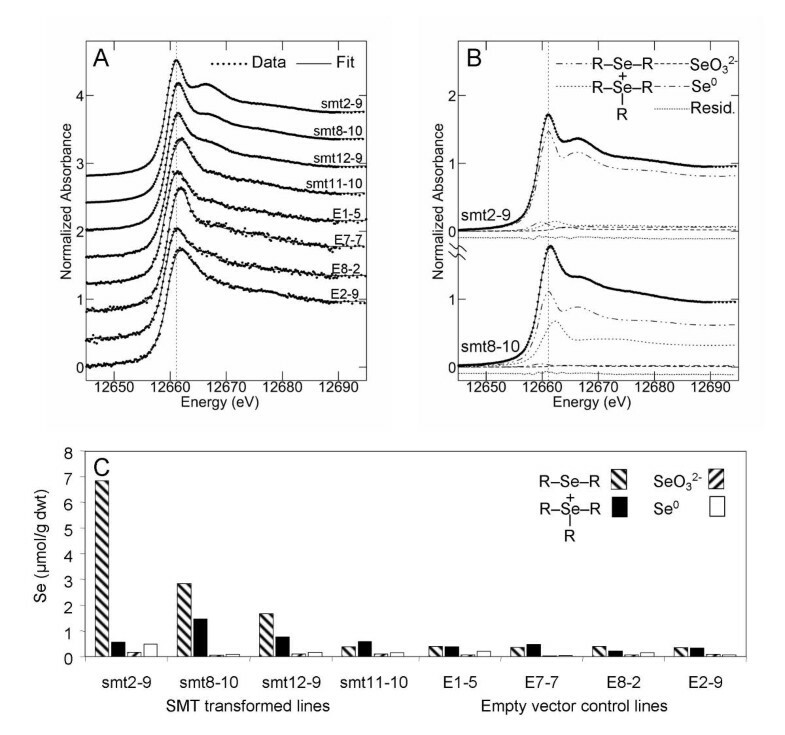 This confirmed that reduction of selenate to selenite is a rate-limiting step for Se assimilation into selenocysteine in plants as established previously , and explains our observation that SMT over-production does not significantly increase the biosynthesis of MeSeCys in selenate exposed plants. The XAS speciation data also supports the conclusion that over production of SMT does not affect the rate of selenate reduction. However, by exposing SMT over-producing plants to selenite, the rate-limiting step of selenate reduction is bypassed and only 1 – 4% of the accumulated Se remains as selenite in SMT over-producing plants, and 3 – 11% in control plants (Fig 3). 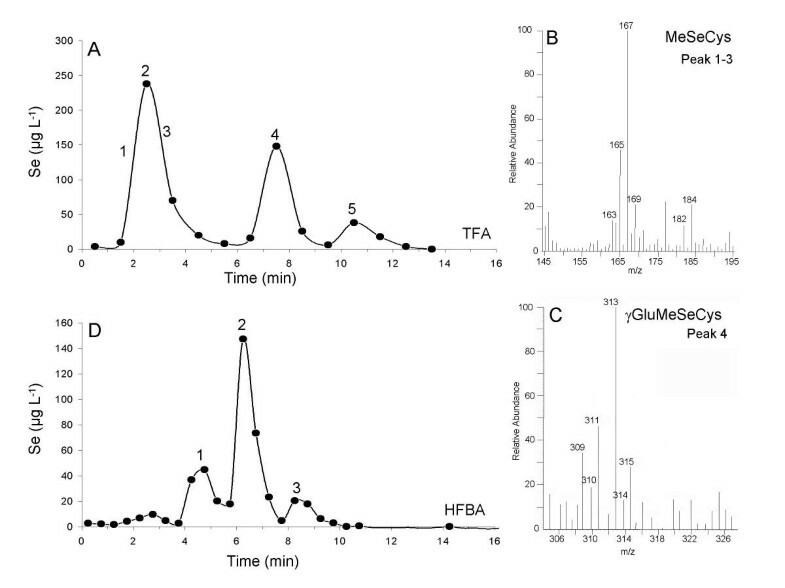 This high rate of selenite assimilation explains why, when SMT is present, MeSeCys and γGluMeSeCys are efficiently biosynthesized (Fig 1A,1B). Significantly, along with accumulation of MeSeCys and γGluMeSeCys, the concentration of total Se in shoots (Fig 1C) also positively correlates with SMT over production (Fig 1A). Total Se increases from approximately 1 μmol g-1 dry weight in control plants (range 31 – 168 μg g-1) up to 8 μmol g-1 dry weight (range 358 – 1020 μg g-1) in the highest SMT accumulating line (Fig 1C). Over-production of SMT resulted in a remarkable increase in resistance to selenite, with SMT accumulating plants showing both increased growth and reduced accumulation of stress related anthocyanin pigments (Fig 4A). To quantify selenite tolerance, a relative tolerance index was calculated that represents the percentage difference between the final fresh weight of each transgenic plant line after growth in the presence and absence of selenite. This relative tolerance measurement clearly establishes that selenite tolerance is strongly correlated with accumulation of MeSeCys, as well as SMT production in 4 independent transgenic lines (Fig 4B). The correlation between MeSeCys biosynthesis and selenite tolerance strongly supports the proposed role of MeSeCys in Se tolerance in Astragalus [40, 47]. However, SMT over-production does not increase tolerance to selenate (data not shown). Because selenate reduction to selenite is very inefficient in A. thaliana and SMT acts to detoxify Se downstream of selenite, it is consistent that SMT does not confer tolerance to selenate. From this, we propose that selenate is directly toxic to plants and efficient reduction of selenate to selenite is required for tolerance. This is supported by the earlier observation that efficient reduction of selenate to selenite, by overexpression of ATP sulfurylase , confers significant tolerance to selenate in Brassica juncia. Whereas Pilon-Smit et al. (1999)  concluded that selenate tolerance was due to increased volatilization of Se in the ATP sulfurylase over-producing plants, we propose that the efficient reduction of selenate is the primary cause of enhanced Se resistance. We would predict that the increased selenocysteine produced in these transgenic plants was detoxified by the low level SMT activity known to exist in B. juncia . In contrast, overexpression of ATP sulfurylase in tobacco cell culture, which does not produce MeSeCys, did not result in measurable selenate tolerance . We suggest that Se is toxic to plants at two biochemical stages, directly as selenate  and via the biosynthesis of Se analogues of S amino acids . The Se hyperaccumulator A. bisulcatus is known to accumulate both selenate and MeSeCys [41, 46]. Therefore, we propose that these plants use SMT to detoxify selenocysteine, and also have the ability to detoxify selenate by utilizing a mechanism that may involve compartmentalization into the vacuole. This proposed mechanism has yet to be identified. Selenite tolerance of SMT over-producing A. thaliana . (A) Growth of SMT over-producing and empty vector control plants in soil treated with selenite. (B) Relative selenite tolerance in soil grown plants is positively correlated with the concentration of methylselenocysteine, and (C) total shoot Se concentration. Relative tolerance is quantified as the percent fresh weight of selenite treated plants relative to the same line grown in the absence of selenite. Data represents averages (± SE) from between 10 – 16 individual plants from each line. Furthermore, selenite tolerance was strongly correlated with total shoot Se accumulation, with the most tolerant lines accumulating the highest shoot Se concentrations (Fig 4C). This increased Se accumulation may be simply due to the more efficient uptake and transport of selenite in the healthy, SMT over-producing plants. However, another possible explanation would be that over-production of SMT may deplete cellular free cysteine, by methylation to methylcysteine (MeCys). Such depletion of cysteine would act to increase the activities of the sulfur assimilation enzymes serine acetyltransferase and O-acetylserine thiol lyase , leading to increased incorporation of Se into selenocysteine. This increased biosynthesis of selenocysteine, and accumulation of MeSeCys, would be expected to form a sink for Se, driving increased accumulation of Se into shoot tissue. In support of this, expression of SMT does result in the accumulation of MeCys, a metabolite not normally observed in A. thaliana (data not shown). Methylcysteine and MeSeCys are produced in approximately equal concentrations, and biosynthesis of MeCys in the SMT-producing plants demonstrates that in vivo SMT has significant methyltransferase activity using either cysteine or selenocysteine as substrates. This contrasts the situation in vitro where SMT has very low activity with cysteine as a substrate . Such in planta methyltransferase activity with cysteine as a substrate is also supported by the earlier observations that increasing the concentration of selenate in nutrient solution resulted in increased concentration of MeSeCys and a decrease in MeCys in A. bisulcatus , while increasing sulfate resulted in the increase in MeCys and a decrease in MeSeCys. This suggests that a common pathway is involved in the synthesis of both compounds. Although MeSeCys is one of the most biologically active Se compounds, the less active SeMet and selenite are the Se forms currently available in the majority of nutritional supplements. The genetic modification of plants to increase the levels of enzymes involved in Se metabolism into MeSeCys would provide a possible source of this chemopreventative molecule. The results presented here demonstrate, for the first time, the practicality of using genetic material from the Se hyperaccumulator A. bisulcatus to bioengineer plants that are enriched in MeSeCys, as previously proposed by Orser et al., (1999) . Shoot tissue of A. thaliana over-producing SMT has a combined concentration of MeSeCys, and its functional equivalent γGluMeSeCys, of up to 3.9 μmol g-1 shoot dry weight (Table 1) after only 6-weeks growth including a 2-week exposure to selenite. Concentrations of MeSeCys and MeCys were also approximately equal in SMT over-producing plants. Since MeCys has been identified as a chemopreventative agent , such a dual function of SMT is expected to further enhance the anticarcinogenic potential of this transgenic plant material. While garlic and ramps have been used to produce similar concentrations of MeSeCys and γGluMeSeCys [15, 21], production of plant material took 6 months  and biomass yields can be expected to be low. The ability to transfer the SMT gene into a higher biomass, rapidly growing, and edible plant could lead to a cost effective method of producing MeSeCys/γGluMeSeCys enriched plant material. The over-production of SMT in A. thaliana also leads to increased Se accumulation and selenite resistance. In the environment, Se occurs mainly as the selenate oxyanion. Detoxification of accumulated selenate requires its reduction to selenite and metabolism into a dead end metabolite such as MeSeCys. Therefore, the ability to engineer selenite resistance in plants, as demonstrated here, is a critical first step in the development of plants capable of hyperaccumulating Se from selenate. Further important steps in this process will be the engineering of enhanced uptake of selenate over sulfate, and its reduction to selenite. In our study, SMT over-producing plants were able to grow normally while containing up to 1020 μg g-1 total foliar Se. Tolerance to such high internal foliar Se concentrations are within the same range observed for naturally evolved Se accumulator plants such as A. bisulcatus (25, 26), and if reproduced in a high biomass plant, these foliar Se concentrations are within the range required for practical phytoremediation of Se contaminated soils and waters. Therefore, engineering of selenite tolerance in plants moves us one step closer to our goal of bioengineering plants ideally suited for phytoremediation of Se. The gene encoding selenocysteine methyltransferase (SMT1) was amplified from A. bisulcatus as described previously , and cloned in the pKYLX plant transformation vector [54, 55] downstream of the cauliflower mosaic virus (CaMV) 35S promoter . Arabidopsis thaliana was transformed using Agrobacterium by floral dipping , and transformed seed selected on kanamycin. Empty pKYLX vector control lines were generated concurrently. Selected T1 plants were allowed to self fertilize, and plant lines homozygous for the SMT1 transgene selected in the T3 generation. Bulk T4 seed was collected and used in all experiments presented. Seeds were planted in Scotts Redi-earth artificial soil mix in 72-cell plug trays, cold treated at 4°C for 3-days to synchronize germination and grown in a climate-controlled room at 19–24°C with 10 hours of light at 90 to 150 μ E. After 4-weeks growth vegetative plants were watered with 100 μM sodium selenite as needed for a further 2 weeks after which shoot tissue of individual plants was harvested, fresh weight determined, washed in 18 MΩ water, ground in liquid nitrogen and stored at -80°C. Each individually stored plant sample was subsampled and used for subsequent analyses. For analysis of total Se, samples of frozen plant material were dried overnight at 60°C, weighed and digested in concentrated HNO3 acid (EM Omni Trace) at 118° C for 4 hours. Se was quantified in the samples using a Thermo Elemental PQ ExCell ICP-MS (Thermo elemental, Franklin, MA) with a gallium internal standard, a NIST traceable calibration standard and external drift correction . To determine extractable and non-extractable Se, shoot tissue (0.25 g – 0.5 g fresh weight) was extracted in 10 ml methanol for 24 hr at 4°C, 6 ml water and 5 ml chloroform added  and total Se measured by ICP-MS in the aqueous phase, and in the chloroform and residual tissue. Extractable Se was functionally defined as the total Se extracted into the aqueous phase, and non-extracted Se was defined as the sum of that in the residual tissue and the chloroform. For routine quantification of SeMeCys and MeCys plant samples were extracted over night at 4°C in 50 mM HCl (2:1 v/w), with 78% recovery of total extractable Se. Alpha amino butyric acid was added to each extracted sample as an internal standard, the samples derivatized and analyzed using the AccQ Tag amino acid analysis system (Waters Corp., Milford, MA) using a Waters HPLC system consisting of a Waters Separation module 2695 with a Waters 2475 fluorescence detector. The identity of MeSeCys in the chromatogram was confirmed by coelution with an authentic MeSeCys standard and of the m/z = 354 ion characteristic of the MeSeCys [6-aminoquinolyl-N-hydroxy-succinimidyl carbamate] AccQ Tag derivative using MALDI-MS on post column fractions after cleanup on Dowex-1-acetate. The presence of Se in the fractions containing MeSeCys was confirmed by ICP-MS (Thermo Elemental PQ ExCell). Recoveries of MeSeCys during HPLC analysis were determined to be 100% using a MeSeCys spiked sample. The identity of MeCys was confirmed by coelution with an authentic standard and by GC-MS after 24 h of extraction in 50 mM HCl and subsequent derivatization with MTBSTFA following standard procedures . Se speciation was further analyzed by HPLC/ICP-MS and HPLC-ESI-MS. Tissue was extracted in 50 mM HCl (2:1 v/w), injected onto a 5-μm Symmetry Shield RP8 (15 cm × 3.9 mm) column (Waters Corp., Milford, MA) and eluted with a mobile phase of water-methanol (99:1, v/v) containing either 0.1% TFA or HFBA at the resulting pH . For quantification of Se in the eluant, fractions (0.5 – 1 mL) were collected and analyzed by ICP-MS (Thermo Elemental PQ ExCell). For molecular mass spectral studies the eluant was analyzed using electrospray ionization on a FinniganMAT LCQ (ThermoFinnigan Corp. San Jose, CA), or LC-Q-Tof micro (Waters Corp., Milford, MA) mass spectrometer system. A tissue sample from one representative plant from each transgenic and empty vector control line was also shipped on dry ice to the Stanford Synchrotron Radiation Laboratory (SSRL) for Se K-edge XAS analysis following our established protocols . Production of SMT in tissue samples from individual plants was determined by immunoblotting and quantified by digitizing developed immunoblots . This project was funded through an STTR grant from the NIH National Cancer Institute (R41 CA80444-01, R42 CA80444-02) awarded to NuCycle Inc. and subcontracted to DES. We would also like to thank Burt Ensley, Graham George, Michael Persans, Jeff Denault and Andrew Baker. The Stanford Synchrotron Radiation Laboratory is supported by the Department of Energy, Office of Biological and Environmental Research, and by the National Institutes of Health, National Center for Research Resources, Biomedical Technology Program. DES and CO co-conceived the experiment with DES guiding the work; DRE, TGS and DGB were primarily responsible for carrying it out with CA contributing to generation of transgenic plants, BL performing ICP-MS analysis, KVW performing LC-ESI-MS, and IJP and HHH performing XAS analysis. Agency for Toxic Substances and Disease Registry. [http://www.atsdr.cdc.gov/].